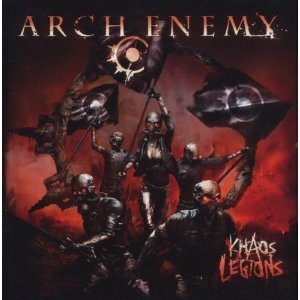 "Khaos legions" is the first new studio material from Arch Enemy sice 2007's "Rise of the Tyrant" - since then they've released the live album "Tyrants of the rising sun" and the studio album "The root of all evil" which was early songs that were originally recorded with their previous singer, re-recorded with Angela providing the vocals. The album includes some fast songs and some slower pounding songs. As usual Arch Enemy manage to combine intricate melodies with brutally heavy metal. Angela Gossow's demonic growling suits the music perfectly and unlike many bands that use growling vocals, Angela's are clear enough to determine the lyrics (I've listened to plenty of bands where the singer could easily have been reading his shopping list as it was totally unintelligible). Unlike most death metal bands, Arch Enemy arent just about insanely fast guitar riffs (although there are some pretty fast bits) - instead Arch Enemy have gone for quality guitar work even if it means playing slightly slower tracks to enable them to enhance the song with top quality guitar work and melodies. In the same way that Metallica with their Master of Puppets album took thrash metal and slowed it down while keeping the power and adding more melody, Arch Enemy do the same with Death Metal. The album kicks off with an instrumental - "Khaos Overture", before the album kicks into high gear with "Yesterday is dead and gone". "Bloodstained cross" is my favourite track on the album so far - superb vocals, great guitar work, changes of pace, and a good chorus combine to make one great song. Most fans of Arch Enemy are likely to love this album. Fans who havent been keen on the more recent studio albums might find this more to their taste as there is more of a feel of the earlier albums here. I for one will certainly be buying the album.